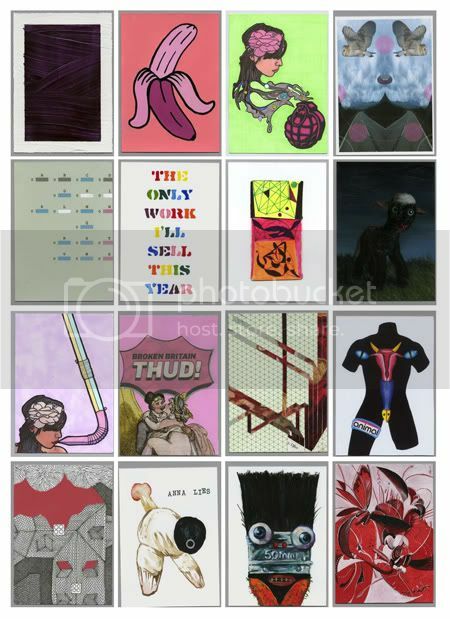 The RCA hold an annual exhibition of original postcard sized art generated by professional artists, designers and illustrators. The really exciting element is that every year they invite a few art gods to submit a postcard into the mix. Past years have seen Damien Hurst, David Baily, Nick Park, as well as fashion designer Sir Paul Smith. This year i am mostly excited by Turner Prize winner Grayson Perry! I really love his latest work the Walthamstow tapestry the details in his work is amazing. Other artists this year include Gerhard Richter, Bill Viola, and Julian Opie. The cool thing is that you don't know what your buying as the artists have signed the back of the postcard, it could turn out to be worth significantly more than the £40 it costs per postcard.